Anyone who ever enjoyed the toasted almond sundae on a stick from the Good Humor man knows the flavor boost nuts get from a quick turn in the heat. Toasting almonds take mere minutes but result in an intensity of flavor and aroma that enhances nearly any recipe or use, including as a snack straight out of hand. The texture of the nuts also improves from a soapy, somewhat soft bite characteristics of the commonly available steam-pastured almonds sold in the United States to a toothier one that remains crunchy even in baked goods. Toasting almonds can also prevent them from sinking to the bottom of a cake or bread batter. You can toast whole, slivered or chopped almonds using the same method, but with reduced cooking times for the cut ones, which burn more easily. If you want to remove the skins from whole almonds after you toast them, rub them between two kitchen towels. For best results, toast whole almonds before you chop them into smaller pieces for use in a recipe. Sprinkle chopped toasted almonds on oatmeal, pancakes, salads, and sandwiches for a protein- and fiber-rich crunch. You can store toasted almonds after they cool completely in an airtight container in a cool, dry, dark location for up to two weeks or in the freezer for three months. 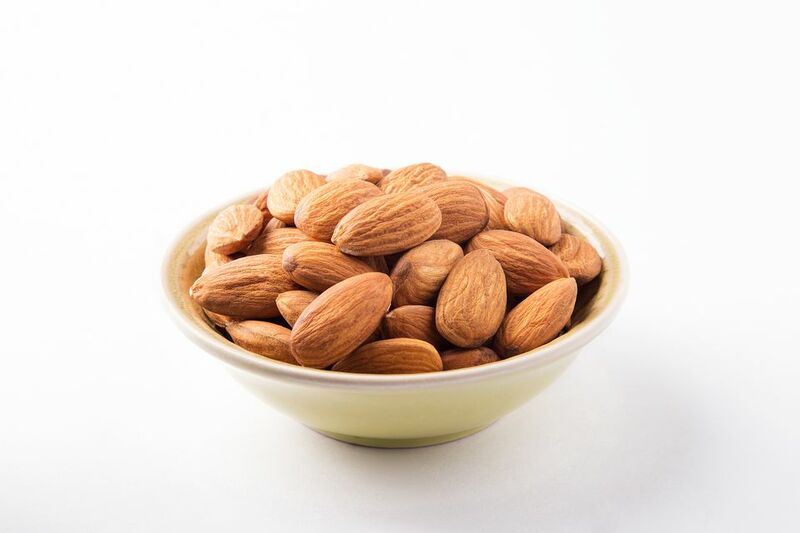 Spread almonds in a single layer in a dry cast iron or heavy stainless steel skillet. Heat them over medium heat, stirring or tossing them frequently, until they turn golden brown and start to smell, approximately three to five minutes for whole almonds. Watch them closely as skillet-toasted nuts burn easily on the spots in contact with the pan; they also continue to darken for a few minutes after you pull them off the heat, so transfer them out of the hot pan to cool. Heat the oven to 350 F. Spread the almonds in a single layer on a rimmed cookie sheet lined with parchment paper. Toast them for five to 10 minutes, shaking the pan a few times to redistribute the nuts so they brown evenly. Pull them from the oven just as they turn golden brown and aromatic, and transfer them (simply lift the parchment paper) onto a cutting board or into a dish to cool. The microwave works for toasting smaller quantities, such as a 1/2 cup of almonds. Spread the nuts in a single layer on a microwave-safe plate lined with a paper towel. You can drizzle about 1/2 teaspoon of melted butter or vegetable oil over the almonds to enhance the browning; toss to evenly coat them all, and then spread them back into a single layer. You can also skip the added fat and toast them plain, although they won't turn as golden brown with this method. Cook the nuts on high power for one minute; stir and cook for an additional minute. Continue stirring and cooking in one-minute increments until the nuts turn golden brown and fragrant. It may take three to five minutes total, depending on the power of your microwave. How Do the Best Restaurants Get Steaks to Taste so Great?